It's here! Big Nick's first Cajun Accordion lessons DVD! 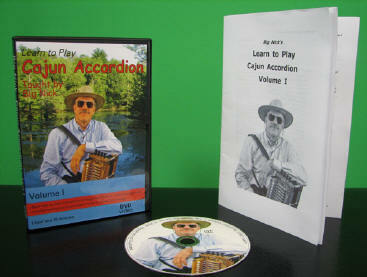 Priced to match the lowest priced Cajun Accordion DVD lessons on the WEB! Only $25 plus $3.00 shipping & handling in the continental USA! This project took much longer than I had expected! Let me tell you a bit about it ..
being introduced to the Cajun Accordion. Simple melodies are slowly introduced with on screen tablature that indicates where to place your fingers. From there, the bass side is added, ornaments are demonstrated, and you even get the opportunity to play along with Big Nick with right, left or both hands. This training session will “fill-the-gap” where other beginning sessions leave off. One hour and 25 minutes long! For shipments outside of the continental US, please email for shipping charges.